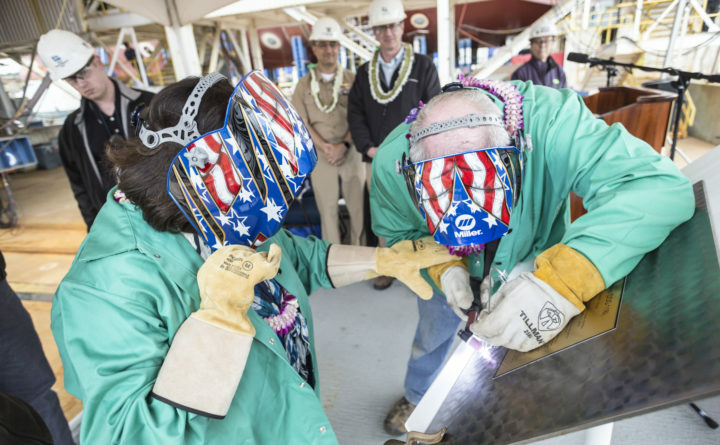 Irene Hirano Inouye, left, and Frank Wood, a Bath Iron Works welder, authenticate the keel of the future guided-missile destroyer USS Daniel Inouye (DDG 118) at Bath Iron Works in Bath, Maine, May 14, 2018. The future USS Daniel Inouye (DDG 118) will be christened June 22 at Bath Iron Works, the company has announced. Inouye received the Medal of Honor for his actions on April 21, 1945, in Italy, when he lost his right arm during a battle but continued to fight until his regiment’s position was secured, according to the U.S. Navy. Inouye’s widow, Irene Hirano Inouye, the ship’s sponsor, visited BIW in May 2018 for the ceremonial keel laying of the destroyer. Details of the christening have not yet been announced.